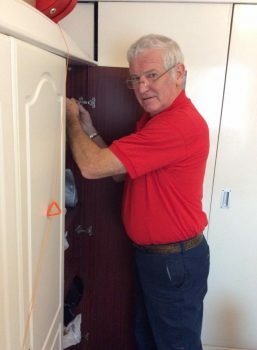 Our handyperson service runs in Stirling and Clackmannanshire and involves older volunteers who complete small and minor maintenance jobs that some older people cannot do by themselves in their own homes. 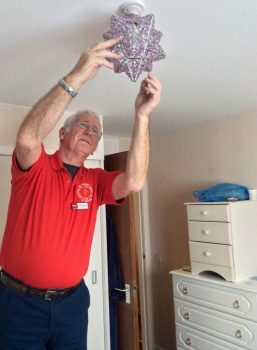 The types of jobs that our volunteers complete take less than two hours and include things such as unblocking sinks, putting up shelves, building flat pack furniture, changing lightbulbs, replacing batteries in smoke alarms and hanging curtains or blinds. It can often be difficult to find tradespeople willing to do such minor jobs and can be somewhat dangerous for older, frail people to do themselves so that’s where our volunteers step in to help. As a result of our service, older people feel more confident in their ability to live independently in their own homes. We also offer fire safety advice and how to prevent a fall at home. Volunteers receive full support from project staff as well as travel expenses, free uniform and health & safety equipment. Volunteers find that not only are they helping others, they’re also strengthening their own communities and networks.